Tips for getting more home for your money - stretch that $. Read 5 tips for getting more home for your $. Every industry, real estate included, has its own "rules of the game". It is important to understand the proper etiquette when you are shopping for a home in Pasadena. An absolutely "must read" when buying a home - 9 Stupid Things Buyers do to Mess Up their Home Purchase. Before you apply for your Pasadena home loan, please take a look at FICO Scores and 5 Steps to a Credit Makeover. This post can save you a lot of money in lower interest rates! Real estate agents are not the same. Each agent has their own style and process on how they work with their buyers. Read What does a buyer's agent do for you to get a pretty good idea on how I work with my home buyer clients. Okay, so you have an accepted offer, you down payment is lined up... what will you be paying in closing costs? Read what kind of home closing costs should I expect during escrow? What are home purchase contingencies? And, can the escrow be cancelled by a seller? 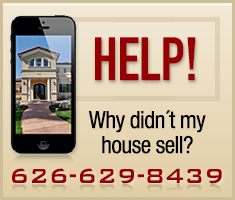 Yes... read how at Pasadena home sale escrow can be cancelled by a seller. When you buy a home in Pasadena, it's usual and customary to put a 3% earnest money deposit. Make sure that you understand how to protect that hard earned money by reading the fastest way to lose your earnest money deposit. Now that you found your home, what kind of inspections should you be ordering? A physical home inspection and sewer line inspection at a minimum! One of the things that home buyers need to decide on while they are in escrow is how to hold title. Take a look at Property Title Insurance - What is it for and what are your options? And, then of course, a critical decision that you will have to make in escrow is How to Hold Title on your home, condo or townhome - 7 Common Ways of Holding Title in California. Does your real estate agent utilize the latest technology tools to sell your home and help you buy your home? The real estate market has changed. What's the saying? "Out with the old and in with the new." Well, it's quite true in many ways. If you are interviewing for your Pasadena real estate agent, take a look at this post - Is your real estate agent using cutting edge technology? How do you interview your Pasadena real estate agent? Every real estate agent market the homes they list a little differently. What does your real estate agent do for you? Social Networking and Real Estate - Read about whyis it important for your real estate agent to have a major presence on social networks?Get an edge over your competition. See also - Is your real estate agent using Social Media to market your home?